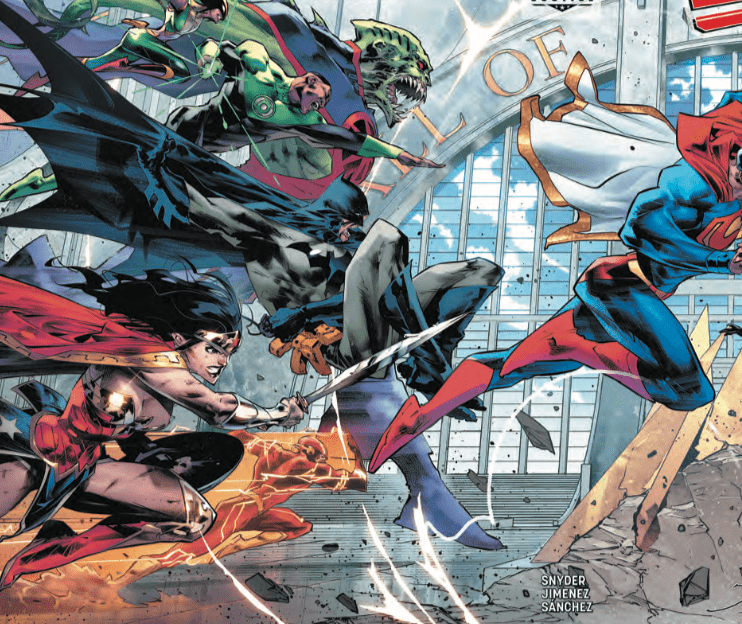 You will never guess who Batman's next Robin is in Justice League #20 – AiPT! The biggest Robin reveal of the century! Spoilers ahead. You’ve been warned. For more read our review. Scott Snyder and James Tynion IV have done amazing things with the Justice League series. The scope is huge, the stakes higher than ever, and the world building fascinating. In the latest story arc things are getting even more mind-bending as we explore the 6th Dimension. In the opening pages, the superheroes are greeted by their future selves. In it, they learn the true path to beating Perpetua (I highly recommend you read the full issue). We soon get to see what it’s like for their future selves and in the first scene, we get a taste of Batman’s new life hunting down criminals. Batman is chasing down Deathstroke who in this scene seems a bit more boastful than usual. Batman asks Robin for some help. Clearly, Batman is out of breath and can’t handle the chase. Who might Robin be? None other than Jarro, Batman’s recent “son” who he has taken under his wing. The mind reading little guy is not only sporting his own Robin costume, but he appears to be gung-ho about fighting crime! Jarro, using his face-cling move takes out Deathstroke with ease. Jarro as a Robin, can you believe it? Scott Snyder even has Batman say: “That’s why you’re my favorite Robin ever.” Jason Todd fans, look away! This is only a sliver of the story and I highly recommend you read the entire issue. You can buy it digitally today.